Singapore-based We Hur has submitted a development application for a new 918 room student hotel tower located at 71-97 Turbot Street & 62-80 Ann Street. 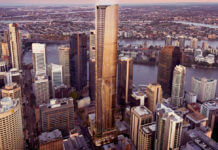 The 5,482 sqm site will house a 38 storey (125m AHD) tower which has been designed by architecture firm Woods Bagot. The development is separated into two stages with the tower being stage one and the restoration and repurposing of the character heritage building as stage two. The site formerly housed Brisbane Fruit and Produce Market and Exchange. These uses were established in 1907. Some existing heritage buildings associated with this former use remain on site. 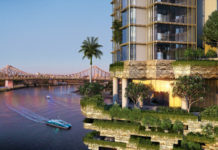 This is We Hur’s second Brisbane student accomodation project after its Buranda Project which is now under construction. The DA number for this development is A004549113. How are there no comments about how well this developer has planned to keep and reuse heritage buildings?? This is amazing to see in Brisbane. They’re keeping more than 400mm of the buildings! !